Rapidly map datastores to underlying shared storage systems with the most contention or performance issues. 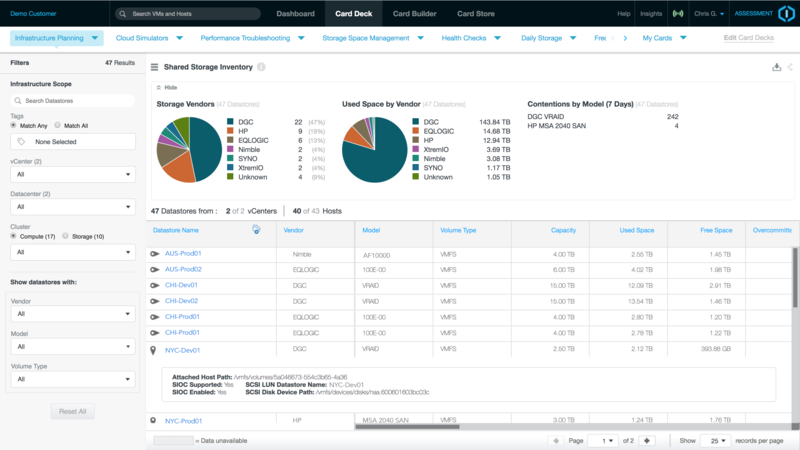 Use this data to help you plan and rightsize VM placement, storage upgrades, and migrations to other platforms or the cloud. With today’s complex data center topologies containing numerous datastores and vCenters, the ability to correlate datastores, hardware vendors, models, capacity and performance for all VM’s and hosts can be a daunting task. That task goes beyond human abilities and requires a data science platform when correlations and changes must be analyzed over time to understand and to predict trends. When trying to identify datastores experiencing the greatest performance issues, this card will help you quickly identify the datastores with the greatest contention, lowest performance, or most activity. Use these results to identify read/write ratios, hardware vendor, and hardware model to quickly determine which resources should be upgraded and the potential impact on your data center. If it Ain't Broke, Don't Fix It, Replace It!